9:00 a.m. to 6:00 p.m., Monday through Fridays, Saturdays by appointment. Do you sell floor cleaners? Yes, we have a selection of manufacturer-recommended cleaners for stone, tile, laminate, resilient, and hardwood floors. 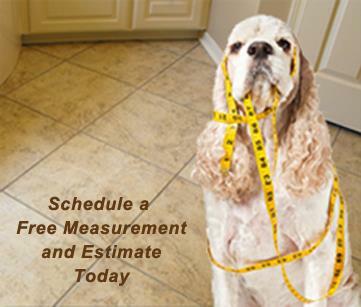 In addition, we carry products to treat carpet spots and remove pet odors. Do you charge for onsite measurements? Do you charge for giving estimates/proposals? Do your sales reps use “high-pressure” tactics? Never. A flooring purchase is a major decision. We won’t ever pressure you to buy before you are comfortable doing so. Do I have to floor my whole house at one time? No, we will work with you to determine a schedule that meets your needs and budget. Yes, we accept Visa, Mastercard, and Discover. At this time, we do not accept American Express. Do you handle flooring repairs? Our usual terms are 50% down payment when the proposal is accepted, and the remaining 50% upon completion of your job. Why aren’t you open on Saturdays? Since we are open until 6:00 p.m. during the week, we can accommodate many of our customers who aren’t available from 9:00 a.m. to 5:00 p.m. All of our employees have families and chores that require our attention on week-ends. That said, if Saturday is the only time for you to shop for flooring, give us a call in advance and we will be happy to set up a Saturday appointment for you with one of our sales reps.
Porcelain tile has to meet a higher standard for strength and moisture resistance. Do I have to seal my grout? You don’t have to, but sealing your grout will protect from liquid spills, when the proper cleaner is used in a timely manner. While most sealers evaporate within 12 months, a high-quality sealer will last up to five years. As part of an overall tile-maintenance program, sealing grout can be helpful in keeping tile floors looking fresh and clean. What determines the price of carpet? Simply put, it’s the quality and the quantity of the yarn fiber. Are all urethane finishes on hardwood floors the same? Definitely not! Discuss the merits of various finishes with your sales rep to learn more. Does Phillips Flooring Center offer financing? Yes. PFC offers financing on new flooring for six months, with no interest, through our partner, GE Capital, for customers with approved credit. A brief application will need to be completed, and financing will be approved within minutes. Do you sell flooring materials only? Yes! For the do-it-yourselfer, we are happy to provide flooring materials and even some basic installation instructions, if needed. Phillips Flooring...where do I start? Not only do they offer quality products at competitive rates, their level of professionalism and quality workmanship is truly rare in today's society. I am so thankful that we were referred to them. Mike and the team at Phillips Flooring are honest, hardworking and dedicated. Thank You so much! Thank you again for a beautiful shower and floor. We love it. It was a pleasure working with Phillips Flooring! Everything turned out excellent I am very pleased!! The shower looks wonderful as well as the backsplash! I will definitely be recommending your company. It is my pleasure to write this letter of recommendation for Phillips Flooring who has managed their portion of a remodeling project exceptionally well. Phillips Flooring provided all the flooring services including the demolishing and replacing of wood ceramic tile for the 2,600 sf remodeling project of Dr. Wacasey's office. The project was located in Longview, Texas and was completed on April 27, 2014. For each and every project, Phillips Flooring has demonstrated their professionalism and commitment to our full satisfaction. From the beginning, the schedule of the project had a very critical timeline and Phillips Flooring was able to meet the deadline while displaying their ability to go above and beyond. This "partnership" proved to be a major factor in the Success of our project. In the end, we appreciate their teamwork and drive to provide quality service and help us meet the overall goal. I would highly recommend Phillips Flooring team and Rodney Phillips and would welcome their contribution to future construction projects. My experience with them was very positive and I trust they would be a reliable choice. As a professional contractor I entrust all of my flooring needs to the team at Phillip's... From Rodney Phillip's, his sales team and all the way thru his installers and warehouse guys... They are all friendly, knowledgeable and help our projects and our customers immensely. Wouldn't let anyone else touch the floors on my job, or mine or my families homes. L and I can't thank you enough for helping with our backsplash tile selection. One of a few times that L liked what she saw at first sight. Will gladly recommend you and Phillips Flooring to anyone needing your product line. Dear Rodney: I am just about to get everything back in place in my house and I just wanted to let you know how VERY much I love all of my new flooring. It is wonderful..the entire experience from start to finish was totally pleasant. I appreciate the help and advice you gave me in selecting just the right tile and carpet for my home. Everything went as scheduled and the workers who came to my home were very knowledgeable, pleasant and hard working. I would recommend your flooring center to EVERYONE! Thanks again for making this major purchase such a pleasant and rewarding experience. Mike, Thanks so much for all that you put into our projects. You really went beyond just doing a good job. It was a pleasure to work with everyone that represented Phillips. Please let them know much we appreciate the kind of service and attention to detail that was provided. We love all the results. Mike, thank you for your patience, professionalism, and genuine kindness. Tristan, thank you for expert, artistic installation. We just walk around our house to admire the beautiful floors, backsplash, and shower surround. You helped ease the stress of remodeling. I have, and will continue to suggest Phillips Flooring to all friends and family. I wanted to take this opportunity to let you know what a wonderful, professional job your employees did on my flooring. You could not ask for a better group of people doing the installation. They were very professional and went the extra mile to ensure that everything was perfect. The new game at my house is for anyone that has not seen the new flooring to guess where the seams were placed. So far, we have no winners, as no one can tell where the seams are, even on close examination. Thanks again. As we finally seem to be reaching the end of this phase of remodeling our house, I wanted to pause and say "Thank You" for the effort and attention you have given our job. With your careful focus, you have given us a beautiful installation - flooring and tile alike. In this era that is increasingly dominated by the Big Boxes, it is good to work with professionals who have their clients’ interests at heart. Much thanks! Rodney, Thank you for my beautiful floors and backsplash. Also for being patient and positive with me and answering my many questions. the installers were are a great team. They were easy to work with and very patient with me. I am very pleased with my floors and backsplash. I will recommend my friends to your company. C and I love our new floor. We appreciate your help, knowledge, and service. 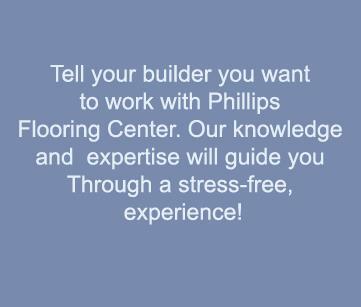 We will not hesitate to do business with Phillips Flooring in the future. I want you to know how satisfied I am with the installation of tile in the bathroom and hall. A word of thanks to Tristan for the time and effort he gave helping with the selection. He was pleasant to work with, and very thoughtful. Brian and Junior arrived on schedule to install the tile. They worked well as a team, and performed their work in a professional manner. I am very satisfied with the installation, and pleased doing business with Phillips Flooring Center. The "About Us" page of the Phillips Flooring website www.phillipsflooring.com says, "We dare you to try to stump us with your flooring and installation questions." and despite my own personal ignorance about the entire Flooring process, Rodney and Sheryl were able to answer all of my questions from everything related to, "These are the floors I have in mind, what do y'all offer? ", "How does this process work? ", and plenty of other questions I had at the beginning of the process. The Phillips Flooring Team made me feel like they were happy to "meet me where I was at" in my understanding of the Flooring process, by answering all of my Flooring questions clearly and with a smile. And then at every step along the way, in the process of installing my new Floors, the Phillips Flooring Team did everything they said they were going to do, as far as *when* they would get started, *how long* the project took, *how well* it was going to be done, and *perfectly cleaned-up* everything when they were finished (installation crew Raul, Martine, and their buddy are experts and artisans....I am *VERY* impressed). I am truly ecstatic about my new Floors, and am super-impressed with the quality of the work that was done on installing my new Floors, by Phillips Flooring. The thing to know is that, truly, at every step in the process, from my initial questions about new floors, all the way until the project was finished and the installation crew left my house, Phillips Flooring delivered 100% and made me feel like a valuable customer. I urge *everyone* looking at getting new Floors to utilize Phillips Flooring's services. We replaced a mix of vinyl and carpet in three rooms and two bathrooms with vinyl plank. Ryan worked with us at the store to decide what would work best for us and he came to the house to measure and provide our quote. The installers were professional worked quickly. They answered any questions I had as they installed. Ryan came back out to the house to inspect the finished project and make sure we were satisfied. I look forward to working with them again when it is time to do more rooms. My first experience with Phillips Flooring Center (as a homeowner) was a unexpected tile job around my bath tub. They worked quickly and left me with a beautiful tile design. My second experience was also unexpected as they replaced nearly 1,000 square feet of pad and carpet in my house after some flooding. Once again, they promptly responded to my needs in unforeseen circumstances and did a marvelous job. I love my new carpet, pad, and tile and look forward to working with Phillips Flooring Center again some day... On purpose next time! They were on time, clean and very professional. Rodney who runs it would talk us though the whole project! Very consistent. I cannot say enough positive things about Phillips Flooring and Sheryl and Rodney Phillips. When our wood floors were ruined due to a backed up sewer problem (at the fault of the city), Rodney came to our home to access the damage, measure and estimate the loss and cost to replace the floors. When we were reimbursed by the city for our loss, Rodney spent time with us in store picking out the best fit for our personal taste and home style. He is incredibly knowledgeable about all of the flooring options. His crew has worked quickly and efficiently and are careful to take care of our personal items and leave our home clean. Rodney and Sheryl are the best folks to deal with: knowledgable, honest, hardworking, trustworthy, kind and patient. 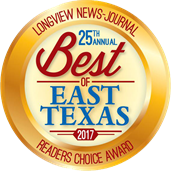 As a professional contractor I have a responsibility to choose the best sub-contractors, suppliers, and installers to work on my projects. Since 2009 I've had an easy choice when it comes to flooring, tile showers, and backsplashes... Phillips Flooring. Best selection, best installation, and by far the best customer service. These folks at Phillips Flooring, Longview, TX laid vinyl flooring last Saturday since Home Depot was unable to lay over the floor we had. PERFECT job, & they will soon be out to repair the job that was done on the carpet by Cooper Flooring!!! If I could rate higher than 5 stars, I certainly would!!!!!!!!!!!!!!!!! Thank you so much Phillips Flooring--you will have our business from now on!!!!! What a terrific company Phillips Flooring is to deal with! They recently redid the flooring in several rooms of our house, and we couldn't be happier. During the decision-making process, they were patient, helpful and knowledgeable. And the young men that installed the flooring did an excellent job and were very pleasant and professional. We'll be sure to use them for any flooring jobs in the future. Thanks for an awesome job! We have used Phillips Flooring for three projects in our house so far. We recommend them often, happy with our floors! I’d give 10/10 if I could! Great people and great company. We recently removed and replaced the tile in our house. Through the entire process, Phillips Flooring was wonderful. From the beginning stages of deciding what flooring type to use, to picking out our tile, to scheduling and finally to completion of the project, we felt that we were in very good hands. I’m so pleased with the quality, the workmanship, the professionalism and the tidiness (super important) that went into this project. I’ll say it again. 10/10!! Fantastic company that provides great service! Great people who will treat you right! Excellent product line, service, and prices. No need to look anywhere else. Recent Bathroom remodel - Amazing process from start to finish!! Phillips Flooring removed my built in fabricated tub/shower, prepped for a walk in shower and tiled it beautifully. I couldn’t be happier. Rodney & Sheryl helped me select tile that fit my budget and were patient with my decision process. Great staff that was helpful in picking out tile designs. Phillips Flooring are phenomenal people. By clicking "Submit", you agree to allow us to use your Review, and any and all information submitted into this form, in Marketing materials; including, but not limited to, this website.